When making home renovations, projects that add value to the home are the ones to consider. Converting an attic to a bedroom, making minor kitchen remodels, and garage renovation are three projects that accomplish that goal. The return of investment on these projects is 84.3 percent for an attic bedroom, 82.7 percent for minor kitchen remodeling, and 83.7 percent for a garage improvement. A bedroom converted from an attic can become the extra room used to host guests, teenagers, or as the master suite. Adding a bedroom in the attic is a smart way to add space without adding an addition to the home. An addition would be a bigger investment of money and time. The basic structure, the floor and the roof, is already in place. The roof’s pitch will slope, and headroom is a bit restricted. Those quirky characteristics are becoming desirable and charming elements of modern design. Personal satisfaction is one of the highest rated items on surveys that rate happiness and satisfaction of renovation projects. The joy score averages 9.4 out of 10, for attics converted to bedrooms, with 10 being most satisfied. Because the kitchen is both a functional and social area, it is likely the busiest room in the home. A kitchen which has been used for decades may have an outdated appearance. Tearing out and creating a new kitchen makes most homeowners balk when they consider cost and value. A minor kitchen renovation is a potential goldmine for sales that may occur in the future. There is no concrete definition of a kitchen upgrade. Typically, an upgrade entails the most visual large surface areas. Those areas include appliances, countertops, and cabinetry. A paint job and thorough cleaning complete the look. Removing countertop supports or walls is not included in a minor upgrade. Having the garage floor painted with epoxy adds to the value and enjoyment of the space. Potential buyers will also see the value of a garage having epoxy flooring. This upgrade is not a trivial for those who want a clean garage or a prim place to park vehicles. There is also an implied value. 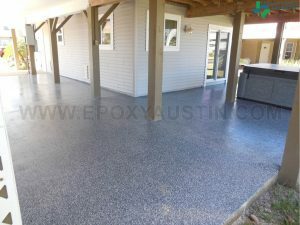 Homeowners, who invest expense and time upgrading a garage floor with epoxy, are thought to take likely care of bathrooms, kitchens, and other areas of the home. While an appraiser may not add or subtract value to or from a home having a garage with an epoxy floor, the real value is the price a buyer is willing to pay. The decision between two similar homes could come down to the choice of a garage with an epoxy floor and one without. The house having a garage with epoxy flooring will likely win out.